Andre Michaux (1746-1802) was born in France . He became a botanist and horticulturalist and was employed by the French government to collect American plants for the royal plantations. He arrived in New York in 1785. He later came to South Carolina and deemed Charleston a suitable place for his nurseries. 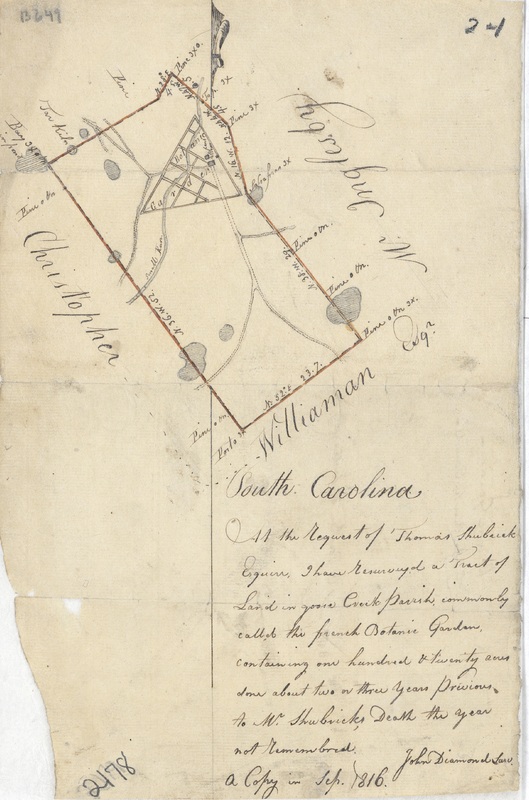 On November 3, 1786 Michaux purchased a tract of one hundred and twenty acres near the present-day Charleston airport and established a botanic garden where he propagated and cultivated the plants he collected for the French government. Michaux left Charleston in August of 1796. This plat, made by John Diamond, is a resurvey of the land “commonly called the french botanic garden”; a copy made in September 1816. Michaux Garden. Courtesy of the Charleston County Register of Mesne and Conveyance.